Pearls have been a coveted adornment for thousands of years, captivating mankind with their singularly beautiful luster and iridescence. 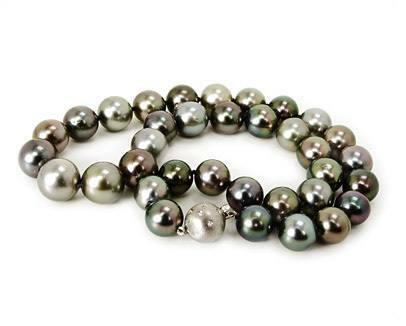 Unlike other gemstones, pearls are not minerals mined from the earth, but treasures found only in the sea. Evidence of the importance and reverence of pearl jewelry can be found in the historical records of many ancient cultures—from China, where pearls were given as gifts to royalty as early as 2300 BC; to Persia, where they were found buried in the sarcophagus of a princess in 420 BC; to Rome, where Julius Caesar decreed in the first century BC that only the ruling classes could lawfully wear them. Luckily, rich, lustrous pearls are now available to everyone. Whether you’re considering pearl jewelry for your everyday, signature look or a special occasion, you can be confident that your look will be classic, timeless, and always in style. Pearls are extremely versatile, and Dominion Jewelers carries an impressive and varied selection of pearl jewelry. The pearls in our earrings, necklaces and bracelets are painstakingly matched for color, size, and shape, and include the sought-after Akoya, South Sea, and Tahitian varieties. From cultured to freshwater, creamy whites and ivories to bold black, Dominion Jewelers selects only premium pearls to create some of the most beautiful jewelry in Northern Virginia. If you can’t find the perfect piece in our showroom, consider the custom design option. Our professional designers can work with you to make your vision, whether sleek and modern or ornate and vintage, a reality. We work with our clients to create uniquely beautiful heirloom pieces that will be passed down and treasured from generation to generation. Pearl wedding jewelry has a rich history that dates back almost as far as the gem itself. Pearls were associated with and worn only by royals and the most elite members of society. Throughout the centuries, pearls could not be afforded by many, so they were cherished and reserved for only the most special occasions, and therefore became the choice for women on their most special of days—their wedding day. A simple strand of white or ivory pearls has traditionally been the most popular wedding accessory, though a delicate pearl pendant has become an on-trend choice for many women. For today’s brides, the design options for wedding jewelry are truly endless. Whether your look is classic and traditional, or unique and statement-making, you can find pearl jewelry that will reflect your unique personality and style. Pearls have long been a favorite for special occasions such as graduations and weddings, but the last century has also seen them evolve into a wardrobe staple worn by some of the world’s most stylish women. Jackie Kennedy Onassis, Audrey Hepburn, Grace Kelly, Sophia Loren and Marilyn Monroe—these iconic women all shared a love for the timeless look of a single strand of creamy, lustrous pearls. Glamorous movie stars and dignified First Ladies alike have made pearls an everyday accessory, a simple statement of grace and sophistication appropriate for any occasion. If you’re searching for a beautiful piece of jewelry to reflect your signature style, pearls will always be an excellent choice. Whether you choose understated pearl stud earrings or a bold strand of oversize South Sea or Tahitian pearls, you’ll be adding classic elegance to your look. No matter how you choose to wear pearls, you should first find a jeweler you can trust, so that you can be confident of the quality and authenticity of your pearls. At Dominion Jewelers, we hand-select each piece of pearl jewelry in our collection to ensure that we are offering our clients only the very best. Our selection, paired with our unequaled custom design services, sets us apart from other jewelry stores in Northern Virginia. To learn more about our pearl jewelry, contact our professional design team or visit our beautiful showroom today. Custom jewelry beautifully created just for you. At Dominion Jewelers, we proud ourselves on crafting custom accessories that make you confident and day-ready for every moment. Precious metals designed specifically for your unique need. Take the next step. Arrange an appointment with a jewelry specialist. Dominion Jewelers has served the Washington DC area and Northern Virginia for 30 years. Our 20 goldsmiths craft breathtaking one of a kind custom jewelry at more than half the cost of designer jewelry. © 2019 Dominion Jewelers. All Rights Reserved.